Consuming cannabis today is much different than it was in the past. Although cannabis flower (usually referred to as bud among older generations), concentrates (old school hashish), and edibles (usually cookies or brownies created with cannabutter) were popular during past decades, the variety of products available in these three categories has exploded in the age of legal cannabis – and dabbing is no exception. New and highly potent strains of cannabis are hitting the market at a record pace, and the cannabis-consuming public has a seemingly insatiable appetite for them. The edibles market exploded during the past decade and goes far beyond cookies and brownies. Although those two dessert staples remain popular, they now compete with a wide assortment of candies, chocolates, beverages, and savory items for those who like to eat or drink their cannabis rather than smoke it. Among the various concentrates now on the market, hashish (aka “hash”) and hash oil remain popular but are losing their appeal to more-potent forms of concentrates like shatter, wax, crumble, taffy, and rosin. A new generation of cannabis users, as well as some from older generation, have a special fondness for concentrates, and this product category drives the industry in many ways. As odd as it may seem to those not familiar with modern cannabis products, most concentrates are not smoked, which is the manner that hash and flower are consumed. Instead, “vaping” and “dabbing” provides a stronger but healthier method of consumption. Vaping and dabbing is the inhalation of cannabis vapor rather than smoke. This vapor is created by heating concentrates to a point near combustion but not quite at the level to produce smoke. Instead, a rich vapor results that consumers inhale. This is generally thought to be less harmful to human lungs than inhaling smoke. The cannabis experience that vaping and dabbing produces is profound and well beyond what results from smoking. This is no doubt some of its appeal to millennials and younger generations. This is definitely not their father’s cannabis experience—although their dads may enjoy it, too. No, this is something relatively new and altogether different. The most popular and convenient form of vaping today is from using a vaporizer pen to consumer cannabis oil, which is essentially what past generations called hash oil, although the viscosity is somewhat thinner. Although disposable vape pens are now growing in popularity for their convenience, the most widely used pens include two parts, a battery, which is the main section of the pen shaft, and the cartridge, which contains the oil and includes a mouthpiece. Vaporizer pens provide a powerful cannabis kick, and are extremely popular because they provide a convenient and discreet way to vape. Some vape pens are “auto draw,” meaning that all you need to do to use them is take a draw from the mouthpiece. When inhaling from the mouthpiece, an auto-draw pen automatically heats the oil in the cartridge and vapor flows freely through the mouthpiece. Other pens require pressing a button to heat the oil and release the vapor. These pens typically have a few heat levels, and the use of button pens of this type is increasing. Either type of pen slips easily into a men’s pocket or women’s purse. They provide the most compact means to consume concentrates, which is a key reason their popularity is increasing rapidly. In contrast to vaporizer pens, dab rigs provide the ultimate dabbing experience. Dab rigs provide a powerful cannabis experience and are to concentrates what bongs are to cannabis flower. 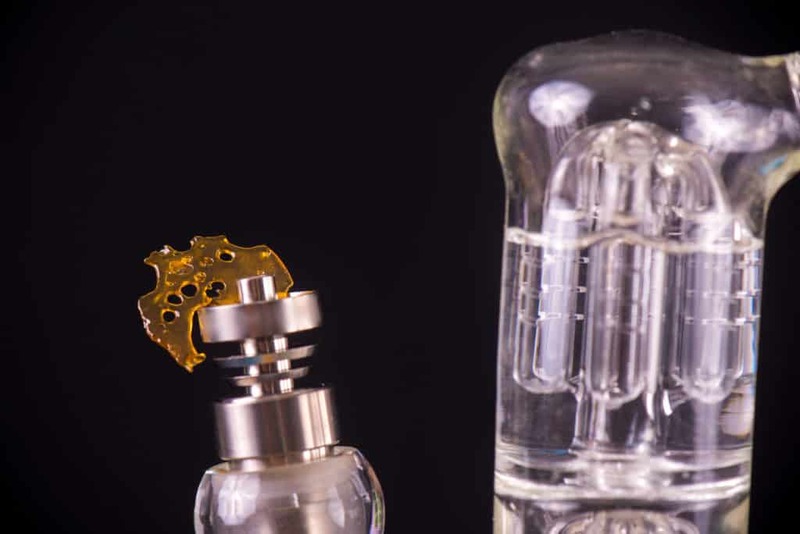 Just like a bong provides a stronger method of smoking flower, a dab rig—which resembles a bong—provides a stronger concentrates experience than a pen. Depending on the heat level of the nail, a dab rig can produce both vapor at lower heat and smoke at higher heat. Dab rigs have several components, and to those unfamiliar with them, the process of using them probably seems complicated. Although this is understandable, using a dab rig is not difficult. Let’s identify the essential equipment and parts of most dab rigs. This section of the dab rig looks very similar to a bong and operates in much the same way. Heated vapor is inhaled through the mouthpiece and travels through water in a lower chamber, which cools it, before being released through the mouthpiece and into the lungs. The dab nail is an essential part of the rig and is the location where cannabis concentrates are placed when using the rig. They are called “nails” because they somewhat resemble a carpenter’s nail. Dab nails vary in quality, largely depending on the material they are made from. There are two main styles of nails, domed and undomed, with domes being the more widely used variety. The nail is hollow, and the vapor flows through it before being cooled by the water and exiting the mouthpiece. Because they are such a vital component of the dab rig, many people who dab regularly put a great deal of thought—as well as a nice chunk of money—into obtaining the best nail possible. The hand torch is exactly what it sounds like, a hand-held butane torch that works like a mini blow torch to heat the dab nail before placing a concentrate on it. The nail works much like the bowl and stem of a bong, except vapor flows through the heated nail when a concentrate is placed on it, and smoke flows through the bowl and stem after its contents are ignited by a lighter or match. Lighters and matches do an adequate job when using a bong, but the more powerful hand torch works much better for a dab rig. The use of a dab tool (aka dabber) is another essential piece of equipment when using a dab rig. Dabbing can be a messy process without the use of a good dab tool. This tool usually is made of stainless steel and is rather simple in design. Most dab tools have two usable ends, one that’s more pointed and the other that’s somewhat flat like a spatula. The nail is gripped by hand on the shaft when collecting a concentrate (usually wax, shatter, oil, or crumble). The tool then is used to transfer the concentrate to the hot nail. As we just learned, although it’s only one part of the dab rig, the nail is extremely important. Most dab rigs are sold with a domed nail. Domed nails are the best choice for those new to dabbing, and they offer some advantages. For one thing, they are generally less expensive, Domed nails also are easier to clean and less wasteful than domeless nails, because the dome holds the vapor in and prevents it from dissipating into the air. Experienced dabbers often prefer a domeless nail because it allows easier access to the nail. People who love to dab often like to take really big hits off their nails, and domeless dab nails allow the person using them to load considerably more concentrate. This, of course, allows them to inhale more vapor or smoke. Newer to the dab scene than traditional nails are the electronic nails that eliminates the need to have a hand torch. Just like it sounds, the electronic nail relies on electricity to reach the perfect heat level. Most people who dab often have definite thoughts about e-nails. Some praise them while other revile them. A dab nail usually is constructed from one of a few materials: quartz, glass, ceramic, or titanium. Titanium nails are probably the most popular, but each type has its advocates. Glass and ceramic nails usually heat quicker than titanium nails, but titanium retains heat better. Let’s identify the benefits and weaknesses of each dab nail material. Undoubtedly the cheapest and most basic dab nail is the glass nail. This type of nail often costs $5 or less, which is a good thing because they are prone to breaking. At lower heat levels, a glass nail can conduct heat fairly well, but at high heat—which many experienced dabbers prefer—it can shatter. Glass nails can also chip and collect concentrate residue quickly, which compromises their performance. Because of this, most experienced dabbers opt for dab nails constructed of other material. Slightly better than a glass nail is the ceramic nail. Ceramic has distinct advantages over glass. For one thing, it retains heat better than glass, and heat retention is always desirable in dab nails. On the negative side, a ceramic nail takes longer to heat than a glass or quartz nail. Another drawback of a ceramic nail is that it is difficult to determine its heat level, and ceramic nails that are consistently heated too high are prone to breakage. Instead of glowing red like a quartz or titanium nail, the ceramic nail usually appears more or less the same regardless of the heat level. The price point for a ceramic nail is higher, too. A decent ceramic nail will cost approximately $15, but the price can go significantly lower or higher. Obtaining a quartz nail is a good introduction to the world of higher-end dab nails. A quartz nail heats fairly quickly and is on a par with glass in this regard. It’s also not prone to breakage like glass. The biggest drawback of a quartz nail is that it loses heat quickly, and heat retention is desirable in a good nail. Gauging the nail’s heat level is much easier with quartz than it is with ceramic, which makes it less likely to scorch valuable concentrates as well as finger tips. Since the quality of a quartz nail is generally better than glass or ceramic, expect to spend more when buying one. All things considered, a quartz nail makes a good choice for novice to intermediate dab fans. The titanium nail generally is considered the best-quality nail. There are compelling reasons for this. For one thing, a titanium nail is lightweight yet extremely durable compared to other nails. It heats quickly and retains the heat well—two other great qualities in a nail. On the negative side, titanium nails can sometimes give a slightly metallic taste to the concentrate that’s dabbed. High cost is another drawback that might make a titanium nail undesirable for some people. A good titanium nail can cost the better part of $100. Regardless of the high cost, it makes the best choice for those who like to vape dabs on a regular basis. As elaborate and complicated as dabbing may seem at first, it’s something that is fairly easy to master. Of all of the equipment necessary for dabbing, the dab nail ranks as one of the most important. A good dab nail is essential for ling-term dabbing and high-quality vapor or smoke. Although glass and ceramic dab nails are great choices for beginners, the quartz and titanium nails will perform much better for intermediate and advanced dabbers who like to dab on a regular basis. Dabbing equipment provides a range of choices at a variety of price points. The cannabis dabbing experience is a powerful one, so buckle up and enjoy!